I am so excited to announce that I will be helping bring the cast recording of Anna Christie to life alongside our incredible cast, legendary 12-time Grammy winning producer Thomas Z. Shepard and conductor Julian Wachner. A co-production of Encompass New Opera Theatre and Trinity Wall Street, our incredible world-premiere cast will return to record the music of Ed Thomas and lyrics of the late Joe Masteroff for worldwide release. Our studio dates are slated for 2019 with an anticipated release on NAXOS. I am humbled and proud of the be a part of the next stage of this work and cannot wait to share the result with all of you. Stay tuned for updates as the date approaches! I am excited to announce that I will returning to the opera stage as Matt Burke in the World Premiere of a new Opera version of ‘Anna Christie’. With Book and Lyrics by Joe Masteroff (Cabaret, She Loves Me) and music by Edward Thomas, it will be presented byEncompass New Opera Theatre in October with a 14-piece orchestra conducted by Julian Wachner. If you’re in the New York area, please join me for this exciting premiere! Click HERE for tickets with more information below. 55 Lexington Avenue (entrance on 25th Street, between Lexington and Third Avenues), New York City 10010. 12 Performances: October 4 – 21, 2018: Thursday, Friday, Saturday at 8:00 pm and Sunday Matinee at 3:00 pm. December 25th is upon us and I wanted to take a moment to wish you all a joyous and restufl holiday season! I hope this note finds you enjoying the holiday season with family and friends. It has been a busy season with lots of activity on Youtube (8 to be exact since Sept!) and live on stage including Bach’s stunning Christmas Oratorio with orchestra in Cooperstown, NY and a host of Christmas concerts and videos. Below are two videos that I hope set the mood and make you smile, one filmed in a bustling Bryant Park. Plenty more to come on my YouTube channel in the coming year thanks to my incredible PATREON family that helps in small amounts to cover production costs and collabs! If you’re curious, love you to consider joining the team! a LATTE lasts an hour, $1 a video lasts forever on YouTube! Click the logo to learn more! It has been a whirlwind month of travel including performances in Canada and an incredible trip to Utah to film a host of music videos and collaborations with world-renowned performers and YouTubers, The Piano Gal and Jason Lyle Black. I recently launched my Patreon page which is an incredible platform for creative endeavors, similar to Kickstarter, but instead of one large project, patrons support continued creative work, in my case fully-produced music videos (up to two a month) on my growing YouTube channel. If you’re interested, you can learn more here! I’d love to have you as part of the team and you can give as little as $1 a creation and set monthly maximums. You’ll have access to featured content, early releases and a host of fantastic rewards! Look out for my first video from this trip, set for release this month with many more to follow. Be sure to subscribe to my YouTube channel and click the little bell for notifications! I am excited to be building my voice studio for the coming season and hoping you’ll join me! If you or someone you know is looking to learn how to sing or build on their skills and talent, I want to help guide that growth. No matter your skill level or the style of music you wish to study, I am committed to helping you feel comfortable with your voice! Improve vocal quality, breath, intonation, stamina and delivery! Over the last few months, I have embarked on a weekly video series with the goal of increasing my YouTube presence. Beginning with weekly cover songs, the plan is to expand to month music videos, vlogs, vocal tips, tricks behind-the-scenes content and more! After meeting with YouTube sensation Peter Hollens, I was inspired to tackle this new frontier, one that has seen incredible growth and for many, has replaced traditional TV with vibrant and engaging content! It is an amazing community and a wonderful platform for creativity. I am excited to add my voice with video ideas inspired by all of you so come and join the conversation! If you’re curious about my channel, I would love you to click here and SUBSCRIBE. Be sure to click the little bell as well (on the YouTube channel) to receive notifications when I upload new content, once a week or more! It was January 19, 2017, and news had just broken that the National Endowment for the Arts (NEA) and Humanities (NEH) could soon be at risk of elimination. As an opera singer and creative entrepreneur, I knew how crucial arts funding was for society at large. The arts enrich the human experience by sparking creativity, collaboration and powerful returns on investment in education and economic growth. I turned to change.org and created a petition (change.org/SaveTheNEA). I’m not sure what I hoped would come of it, but I knew that this was an issue near and dear to my heart, and perhaps, if enough everyday Americans realized what was at stake, the community could have a fighting chance. A ‘Who’s Who’ of Broadway, Hollywood, theatre, dance, and music artists came together at the legendary Avatar Studios in New York City to record and film a single of the iconic Beatles song “A Little Help From My Friends” to inspire support for the arts in America. 100% of net profits from this recording will go towards Americans for the Arts and their work to protect the NEA, support arts education and advocacy, and continue to fight for our beautiful industry and all that it does to foster community, creativity and economic growth. #SavetheNEA Petition and Video project! In January it was announced that the National Endowment for the Arts (NEA) and National Endowment for the Humanities (NEH) could loose all funding. The NEA has been the life-blood and foundation of the arts community across our nation since 1965. They provide grants for dance, music, drama, literature, outreach education, and so much more. With the petition surpassing 35,000 signatures, it became clear that more could be done to spread the message. 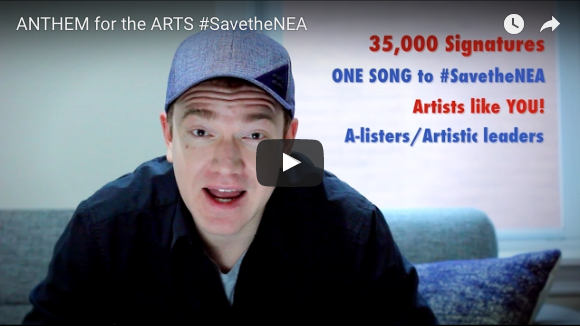 So began our project of one ANTHEM to support arts in America and #SavetheNEA and an invitation to the US Senate! Watch the video below to learn more and HOW YOU CAN HELP us reach our FUNDING goal! It will involve artist from all artistic disciplines and YOUR video submissions from across the country. Stay tuned for updates from beautiful Savannah, Georgia as I return to the American Traditions Competition to compete for first prize, perform everything from Opera and Musical Theatre to Folk, Vocal Pop and more. If you’re in or near the Savannah area, I’d love to see you there! My first day of competition begins on Wednesday, February 22nd. You can visit the official website to learn more! ‘Tis The Season! Holiday Single And More! Seasons greetings to you all and I hope this message finds you happy, healthy and calm amidst the hustle and bustle of the season. As my first Christmas away from Canada and my family, it is somewhat surreal to hear tunes like ‘White Christmas’ in the heat of the Australian summer, but I am starting to adjust. Without a doubt, I do miss the crispness of a sunny Canadian winter morning. As promised, I am excited to bring you my first of new monthly music videos and my latest for ‘Homeward Bound’, by Martha Keen. Click below to watch and if you enjoy it, please consider a share, thumbs up or both! It is available now on iTunes, Loudr, Google Play and Spotify. I had a blast filming this video in beautiful Airlie Beach, Queensland and The Fiordlands, New Zealand. You can also find my video for ‘O Holy Night’ released in 2014. Click the image below to watch ‘Homeward Bound’! It has been a busy month Down-Under with repeat performances of our production show ‘ENCORE’ and grateful for standing ovations every night! I also received a last minute request to perform my solo show ‘These Miles’ on board, featuring songs from my album, classical musical theatre and crossover repertoire with a 7-piece orchestra. It was a treat to perform for such an engaged audience. Keep in touch on Facebook, Instagram, Twitter and more as the adventure continues! As always, thank you to each of you for your support and staying in touch and I wish you all a lovely season and Happy New Year with family and friends. Admin Login | Site by Mediavandals.